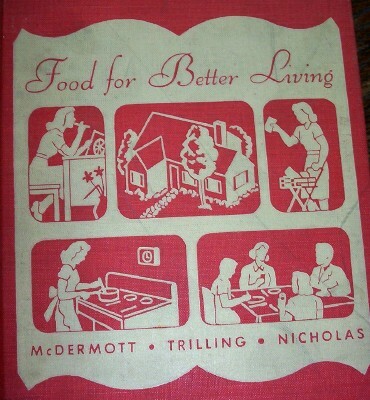 I just unpacked this 1949 home economics textbook. I bought it before we moved and hadn't had time to look at it yet. Flipping through its chapters, I am amazed by its detailed curriculum. I also like the vintage recipes; they don't typically contain processed foods. Wow, I hate to admit that I'm jealous but...I totally am! Old Home Ec texts and housewifery manuals are among my favorite reads. What a great find this one is - a keeper for sure! One of my treasures is my Mom's home ec cookbook from 1937. It has great recipes, pictures, menus, etc. The binding is a bit worn, but I still love it. Oh, forgot to add, I also have several Mennonite cookbooks that do not call for processed foods. I've picked these up at estate auctions over the years. They are great for when I want to bake something with only a few basic ingredients. I have loved your last few posts! I hope you share what you learn from this book! Meredith, Neat book!! I hope you'll post some of the recipes from it. Oh I am so envious! I too have a passion for vintage domestic economy books. Please do share some recipes or more delightful photos. I WANT the pantry in the photo below - and her apron too!